Selena Thinking Out Loud With Purpose is so excited to team up with the hosts and co-hosts to bring you this Bagluxe Fashionable Handbag Giveaway for the summer 2012! I love wearing styles that are outside of the box and accentuate my creative side. Bagluxe has a great inventory of handbags that would compliment any outfit or occasion. What makes this such an AMAZING giveaway is that five (5) Winners will be selected! Normally, one lucky entrant gets to win but I love it that we are able to provide five (5) of our readers with the opportunity to win. The host has really done a great job with sharing what Bagluxe has to offer you as a company and how affordable they are to the working woman, stay-at-home mom, or actress who supports creative fashions, such as myself. 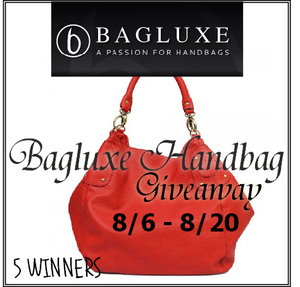 Read about Bagluxe from the host, Bella Savvy, then enter all of your entries using the Rafflecopter Entry Form provided for you below. I'm crossing my fingers for all of you and hope that the majority of the winners come from my blog readers and visitors! Good Luck, Selena. Disclaimer: Selena Thinking Out Loud With Purpose is not responsible for the deliver of the winners handbags. The host, Bella Savvy is responsible for notifying the winners and providing the necessary information for receipt of all handbags. I love Morgan Go Girl Hobo Black. I like the Lexi Studded Bag Grey.